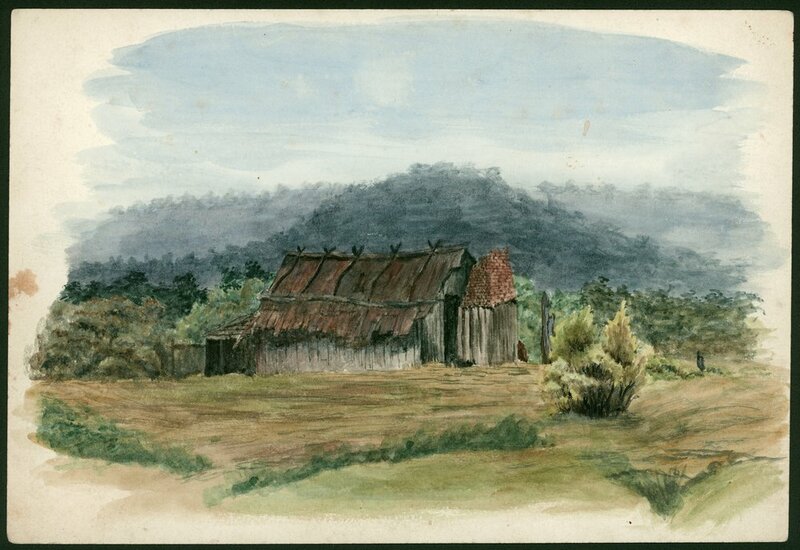 Do you have a favourite Australian genealogy record? For me, it’s the Electoral Rolls. When they first became available at Ancestry, I spent hours finding addresses, checking Google maps, finding occupations, spouses and unusual living arrangements. That’s when I came to grow fond of a little branch of my Diwell family. The head of the family was Thomas Edward Diwell, my 3 x great uncle, and his wife, Mary Jane Pretlove. 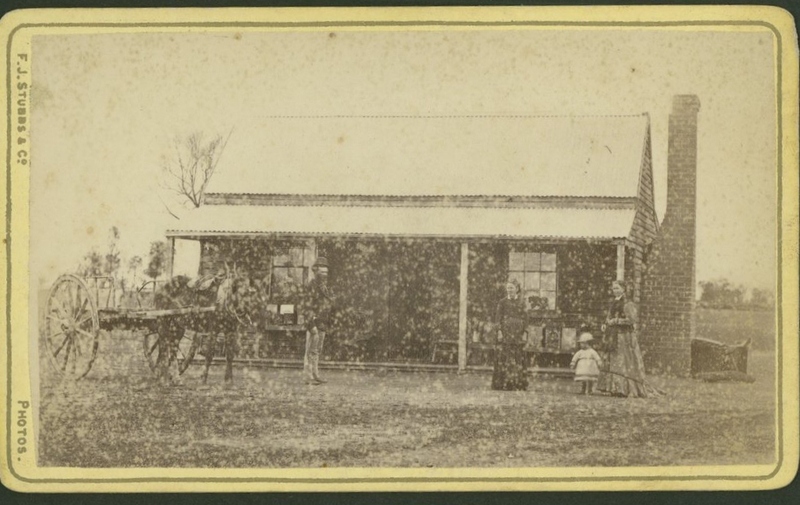 Thomas, a blacksmith, was the son of the first Diwell arrivals to the Western District, William Diwell and Margaret Ann Turner. Thomas and Mary Jane married at Sandford in 1899 with their first child, William, born at Casterton in 1890. 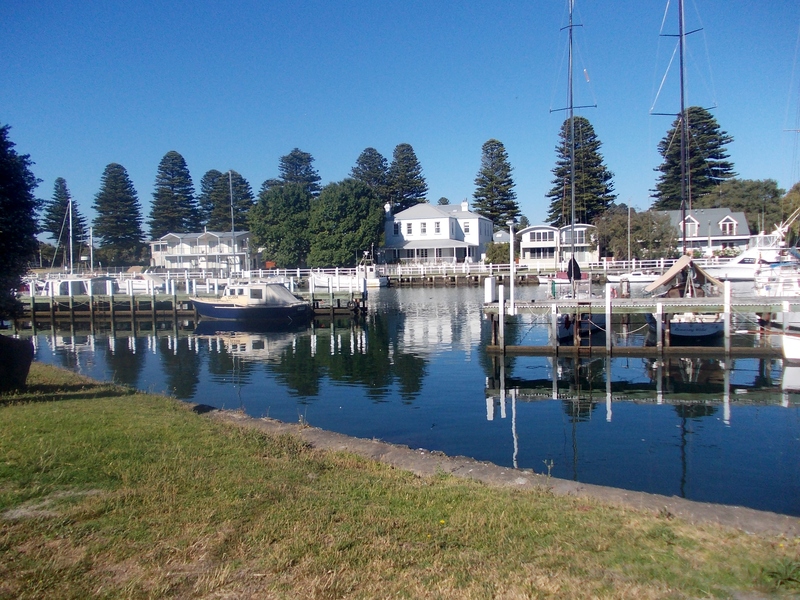 Then Thomas took his family further than any of his family had been before within Australia and moved to Balranald in south-west New South Wales where they remained for some years. 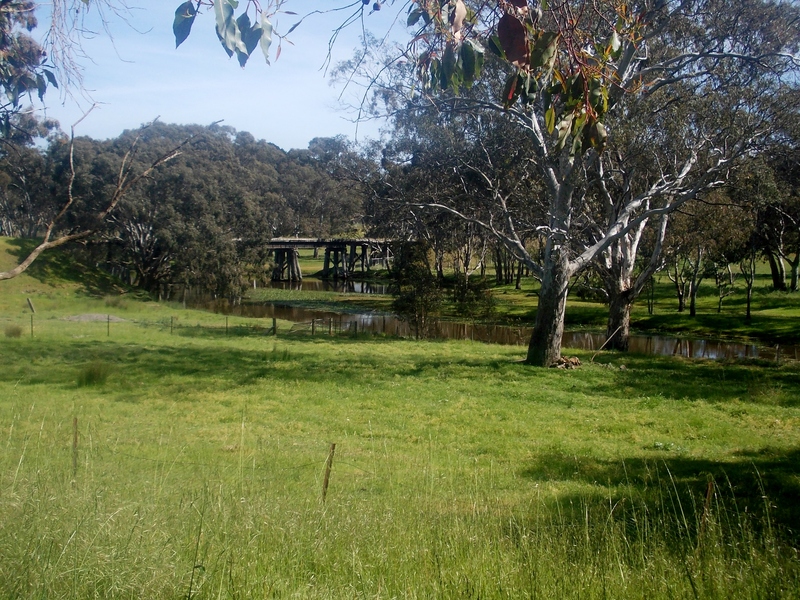 Nine children were born in Balranald, including a set of twins. Sadly they lost two children, including one of the twins. In 1913, eldest daughter Florence married at Balranald. 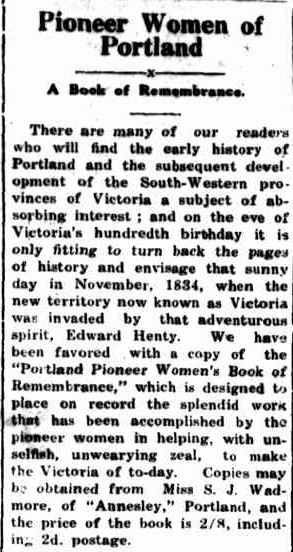 Around 1914, some of the family moved back to the Western District and a further child, Eva Muriel, was born at Hamilton. Eldest son William was at Dartmoor working as a blacksmith. At some point before 1919, Mary Jane and some of the children moved to Carlton, while Thomas seems to have travelled for work, listed at Donald and Beenak on the 1919 Electoral Rolls. But not everyone was living together. Third child, Daisy Isabel, aged 26, was working as a packer and living at 171 Drummond Street Carlton, older brother William, a returned serviceman, was a student and living at 53 Barkley Street Carlton and mother Mary Jane, presumably with the younger children, was at 203 Drummond Street, Carlton. 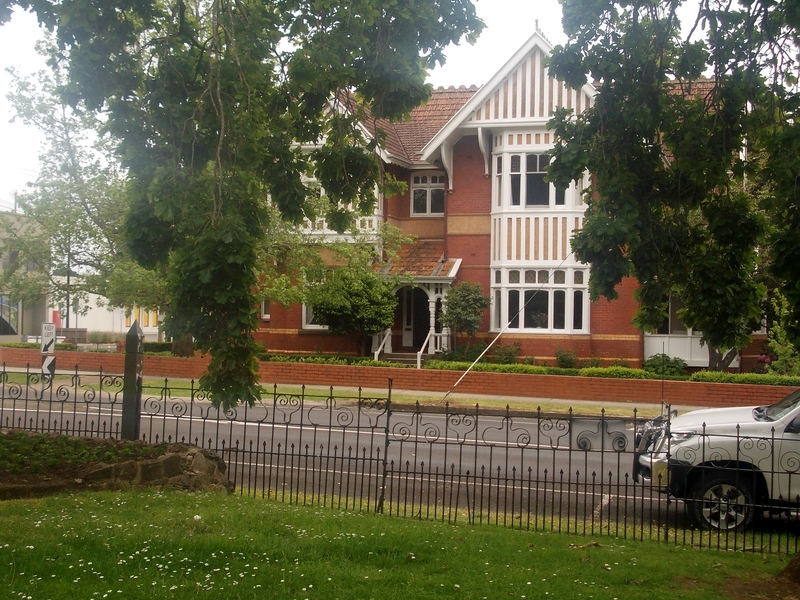 By 1924, the family had moved to 134 Johnston Street, Fitzroy (below), during a colourful period in that suburb’s history. 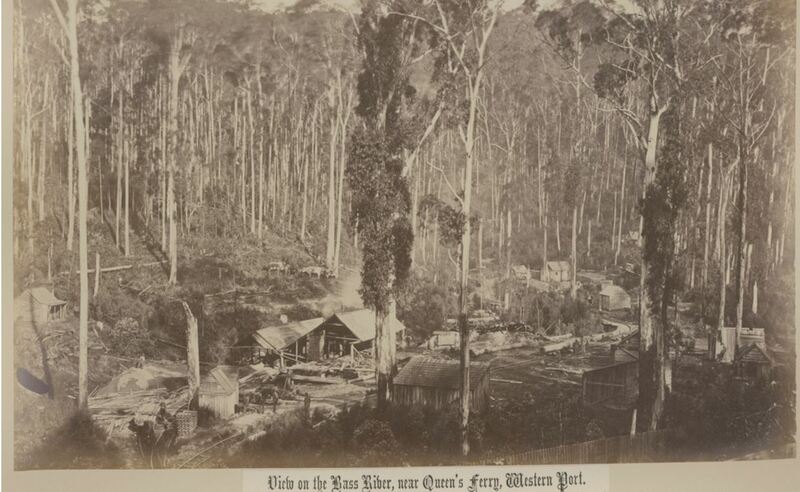 Father Thomas was, according to the Electoral Rolls, not in Melbourne, but instead living at Beenak in the Warburton area at least until 1928. He reappeared on the Electoral Roll with the family in 1931, by which time they had moved next door to 132 Johnston Street Fitzroy (below). 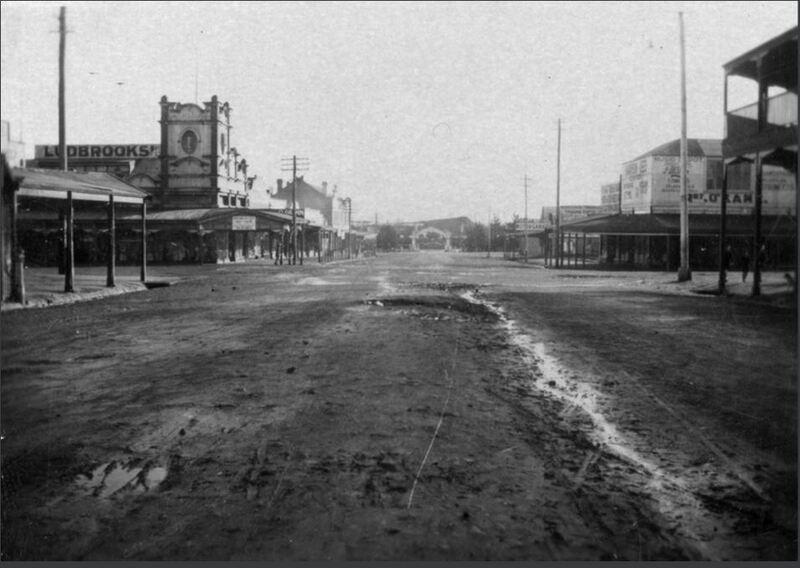 So here was a family, used to living in an isolated country town, now residing in Melbourne’s bustling and bursting inner north, renown for slums and crime. That alone captured my interest. But what really attracted me to the family, particularly Daisy, other than her lovely name, was that her occupation on the Electoral Rolls was confectioner. 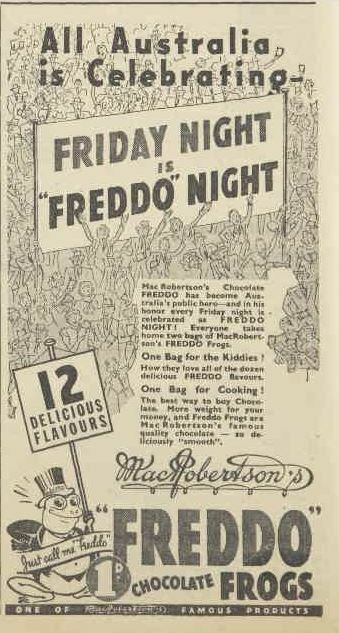 Taking that clue, I found that MacRobertson chocolates had a factory in Fitzroy, just down the road from the Diwells, so there was a strong possibility that Daisy worked there, making some of my favourites, including Freddo Frogs and Cherry Ripes. Even sweeter. I put Daisy away for awhile…until recently. 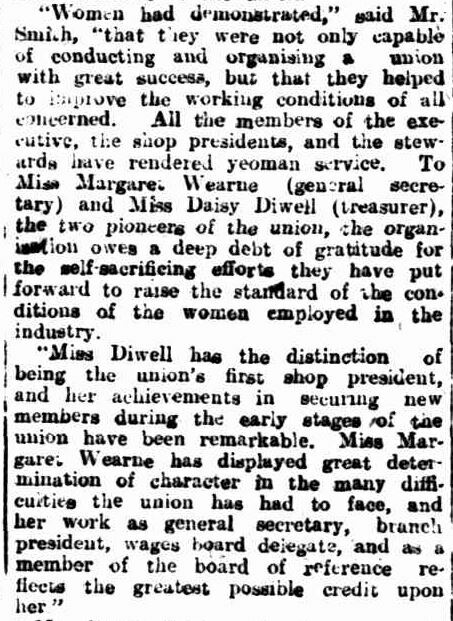 A new discovery, an article from Adelaide’s Daily Herald, has me liking Daisy even more because Daisy fought for workers’ rights, particularly female workers, with her involvement with the Female Confectioners Union. 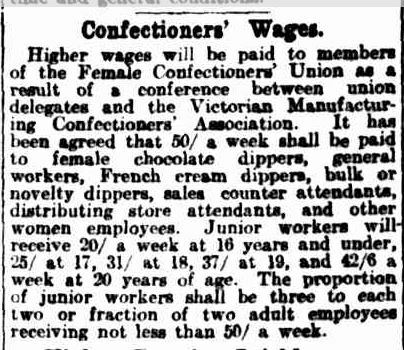 The Victorian Branch of the Female Confectioners Union, formed in 1916, met for their annual conference in February 1921, the subject of the Daily Herald’s article. Mr E.H.A Smith, the union secretary, reported on the progress the union had made during the previous six months. 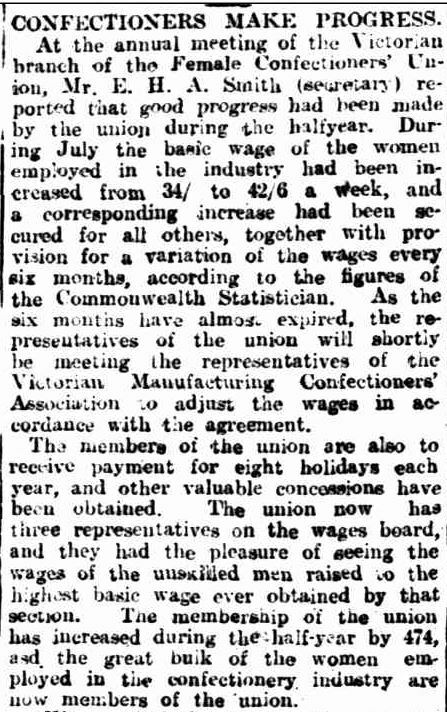 Wages had increased, eight days paid leave achieved and, in just six months, the union had increased in number by 474, with most of the women employed in confectionery manufacturing being paid members. Mr Smith then passed on his congratulations to the leaders of the union, pointing out the unselfish work done by Margaret Wearne, the general secretary and Daisy Diwell, the treasurer, two pioneers of the union. 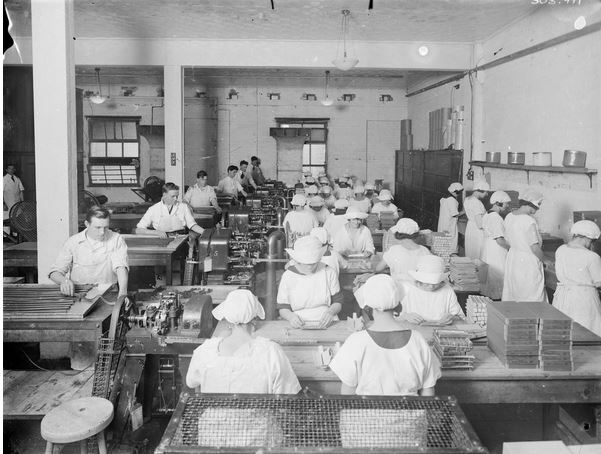 By the end of 1921, the female confectioners had achieved another pay increase. Naturally, after that find I had to keep digging. Some bits and pieces came up, but finally, I found a recent essay, “A fine and self-reliant group of women”: Women’s leadership in the female confectioners union” by Cathy Brigden (2013). From that, I found out a lot more about Daisy. 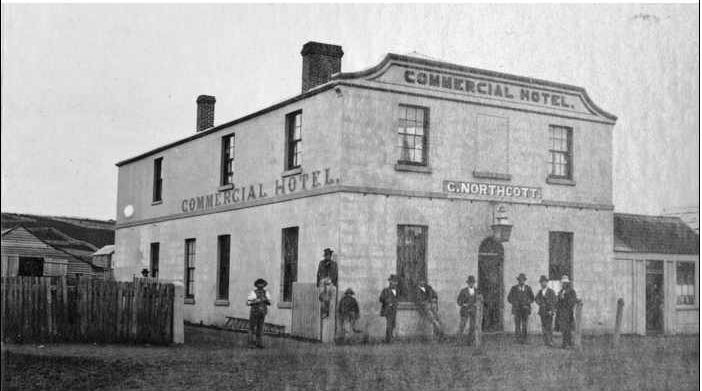 She did work at MacRobertsons and had been there since at least 1918. Also, when living at 171 Drummond Street, Carlton, she was boarding at the home of two of her co-workers and union members, Elsie and Maud Hood and their parents. Brigden’s study revealed, the three girls, Daisy, Elsie and Maud came to the fore as leaders of the union in 1918, tirelessly recruiting other girls to the union and Daisy became treasurer. It was, however, that dedication that contributed to the failing of Daisy’s health and in 1921 it forced her resignation from her union role. Despite not being a union official, it does seem that Daisy kept working at MacRobertsons with her occupation listed as confectioner up until the 1943 Electoral Roll, four years before her death. Since her last change of address was for the 1928 Electoral roll, I can only assume she was a confectioner up until that time, but it is unlikely she took the trouble to update her occupation on the Electoral rolls when she had no need to update her address. 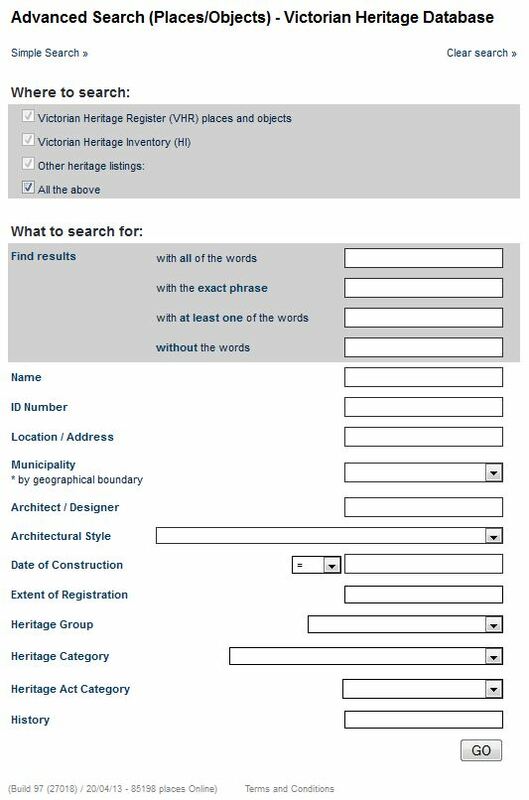 Since the Electoral Rolls have been available up until 1980 on Ancestry, I have been wary of assuming a person remained in their listed occupation when they did not move their residence. I realised this when I saw my mother’s entries on the 1977 and 1980 rolls In 1977 she was a teacher and in 1980, again a teacher. However, she left teaching around 77/78, and was a business proprietor in 1980, but did not change address between 1972 and 1995. Therefore if I were to check the Electoral Rolls beyond 1980, Mum is probably listed as a teacher up until 1995 when she had to change her address details with the Electoral Office. That’s going to confuse some eager genealogist in the future. 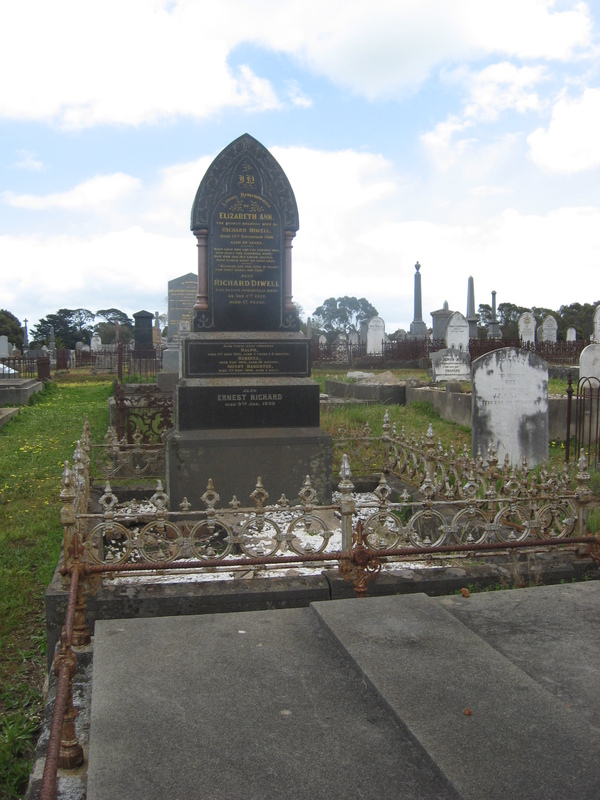 Daisy died in Fitzroy in 1947 aged 54. She never married and predeceased her mother Mary Jane, by seven years. 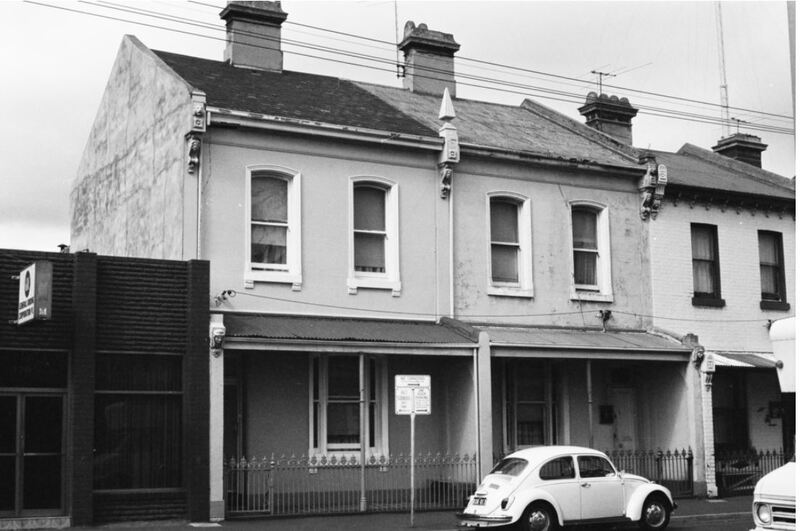 Thomas had passed away in 1932 and Mary Jane continued to live at 132 Johnston Street, Fitzroy with her daughter Margaret, also a confectionery worker. So who or what was MacRobertsons? 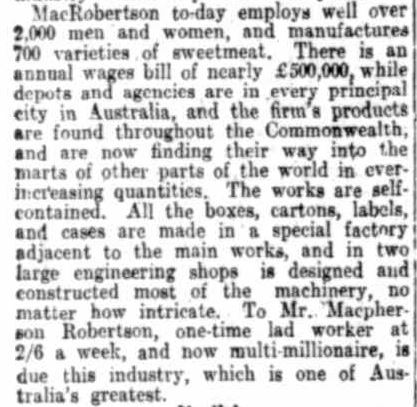 In 1880, MacRobertsons had humble beginnings in the family bathroom in Fitzroy, of Ballarat born Macpherson Robertson, then aged 21. The business grew from a small bathroom to the huge factory where Daisy worked. 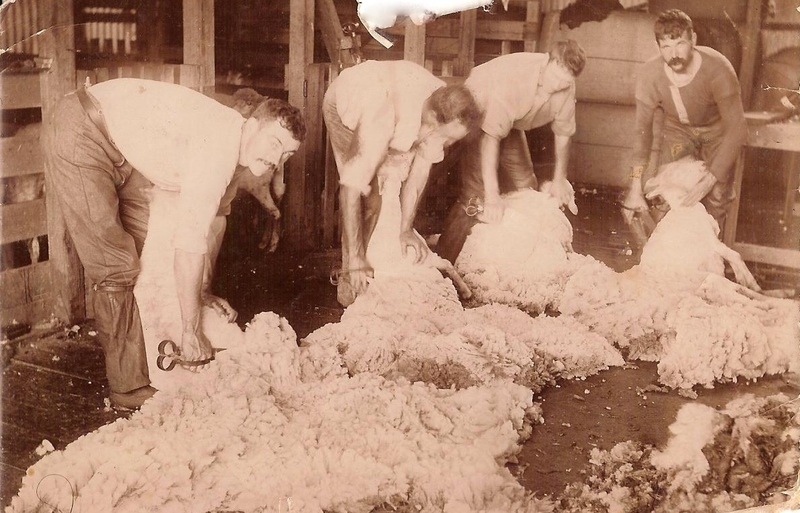 Everything at the factory was white and it was known as “White City”. The factory workers wore white. 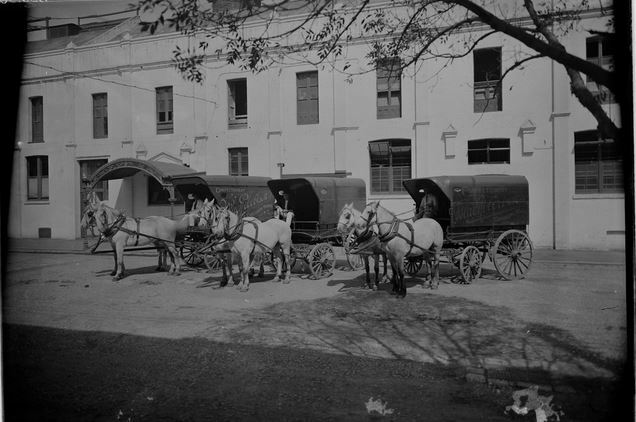 the buildings were white, the delivery horses were white and even Macpherson Robertson wore white. 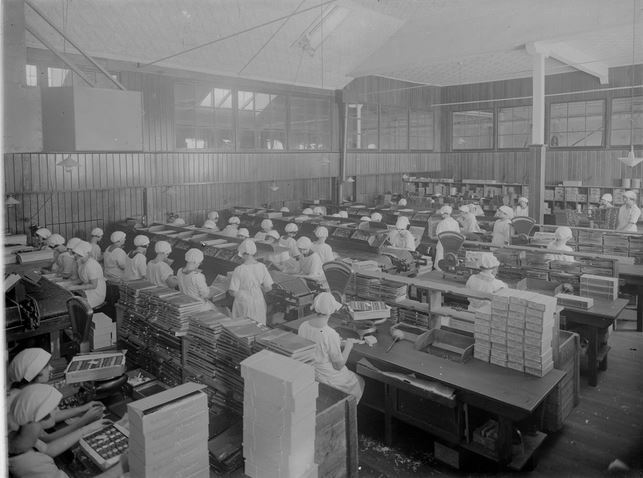 The factory was self-sufficient with even the chocolate boxes produced there. Robertson was a father figure to his staff, had an interest in their welfare and supported the Female Confectioners Union. In 1921, he authored a book, “A Young Man and a Nail Can: An Industrial Romance”. 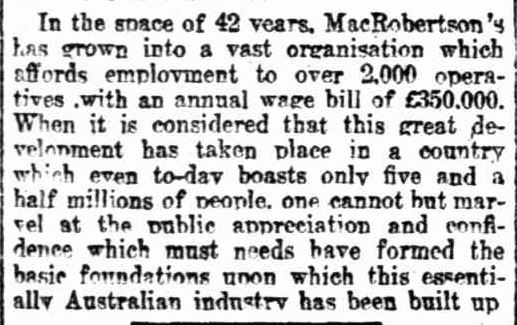 MacRobertsons introduced fairy floss and chewing gum to Australia and by 1923, the business had grown to 2000 employees earning a total sum of £350,00 per annum and the profits were flowing. As I read about Macpherson Robertson. I kept thinking, “Didn’t Roald Dahl write about this guy?”. 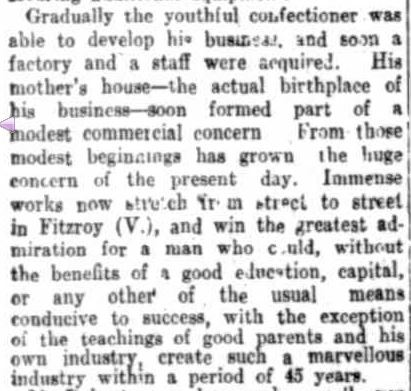 Then I found an article by Kirstin Masters, entitled Australia’s Willy Wonka: From Home Candy-Making to Confectionery Magnate. Say no more. Now that I have found this latest information about Daisy, it has opened up a whole new line of research. Just for starters, there are four archive boxes of minutes, copies of the “Women’s Clarion“, the union’s journal, and photographs held by the University of Melbourne Archives. There are a multitude of histories about MacRobertsons and the man behind the brand, so I’ll be reading everything I can from that respect. 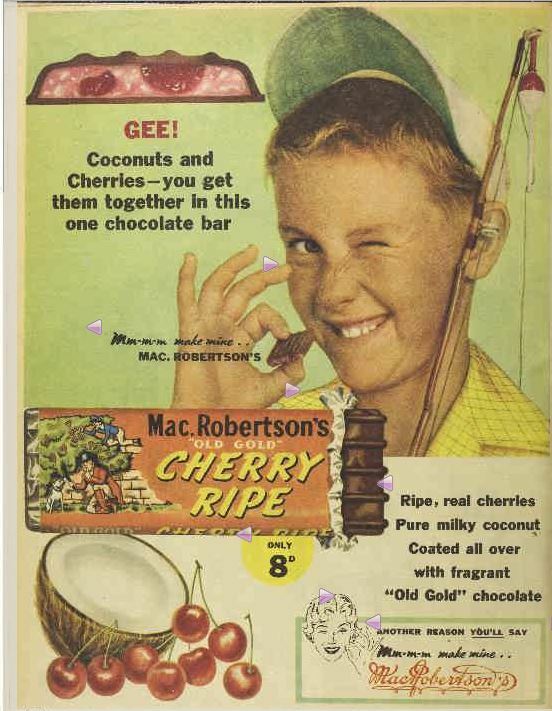 Until the next update on sweet Daisy, here are some wonderful advertisements for my favourite MacRobertson’s products, from the Australian Women’s Weekly. Brigden, Cathy (2013-05). “A fine and self-reliant group of women”: Women’s leadership in the female confectioners union. In Labour History. (104), 49-64. 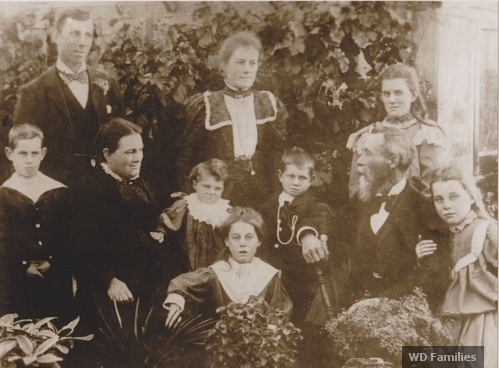 This is Richard and Elizabeth Diwell and their family in the spring of 1900 in Hamilton. The eldest child, Margaret was nineteen and the youngest, Martha was two. Elizabeth, at forty-four, was in the last months of pregnancy and was radiant. Martha’s hand rests comfortably on her mother’s growing stomach. Edith clutches the arm of father Richard, a successful bricklayer and keen gardener, a member of the Hamilton Horticulture Society. Chrysanthemums were one of his specialities. Within months, this serene family scene was shattered. 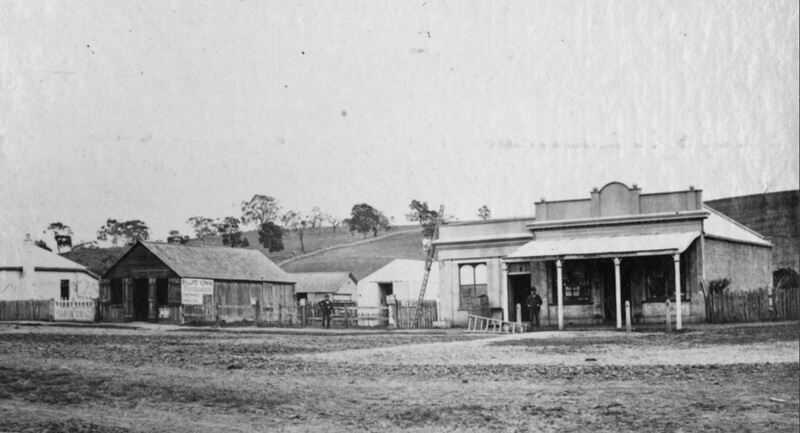 Richard Diwell and Elizabeth Jelly married in June 1877 at Casterton. 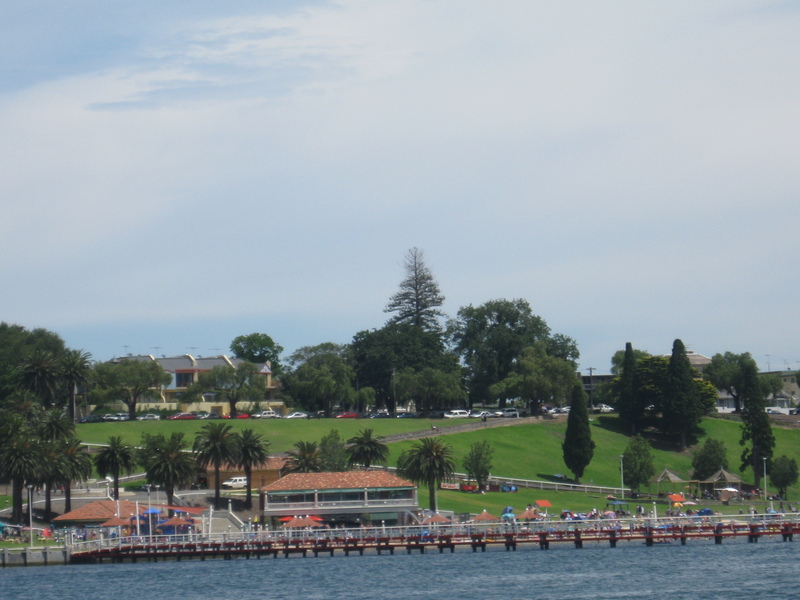 Richard, born at Portland in 1854 was the son of William and Margaret Diwell and was their first child born on Australian soil after their arrival in 1853 aboard the Duke of Richmond. William too was a bricklayer. Elizabeth was the daughter of George and Jane Jelly and like William was her parents’ first born in Australia. 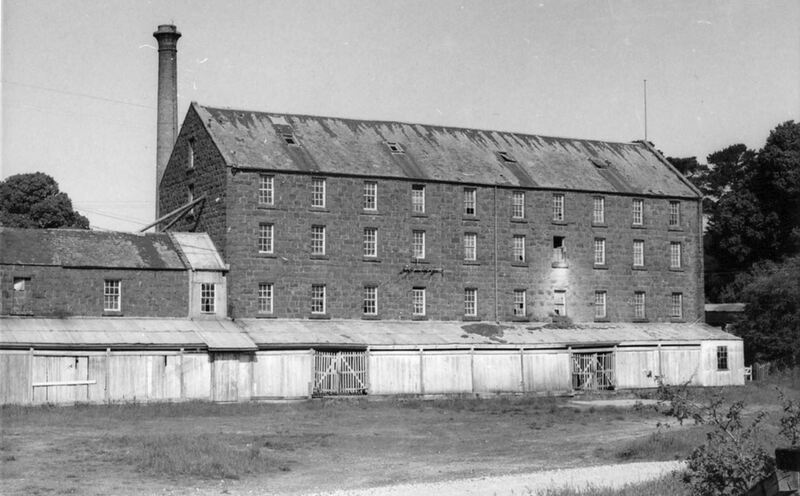 They had arrived in 1855 on the Athletae and moved to Casterton where Elizabeth was born in 1856. Sadness came early in Richard and Elizabeth’s marriage with their first born child, Ada Jane, dying within her first year of life. Six more children, Margaret, William, Jane, Ralph, Edith and Ernest were born in Casterton over the next eleven years until 1891. 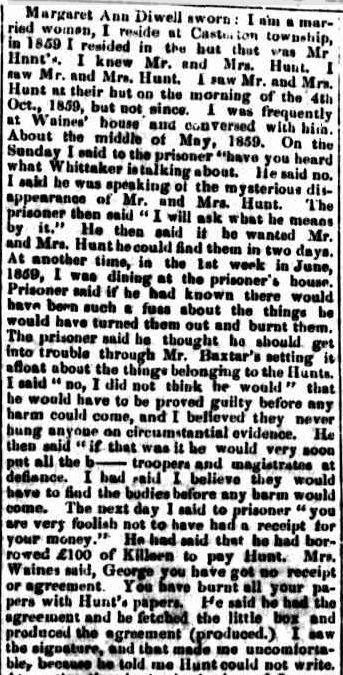 It was in that year that Elizabeth, her mother and sister-in-law, Annabella McIntyre, signed the Victorian Women’s Suffrage Petition along with one hundred other Casterton women. It was their contribution to the cause championing for equal voting rights for women. 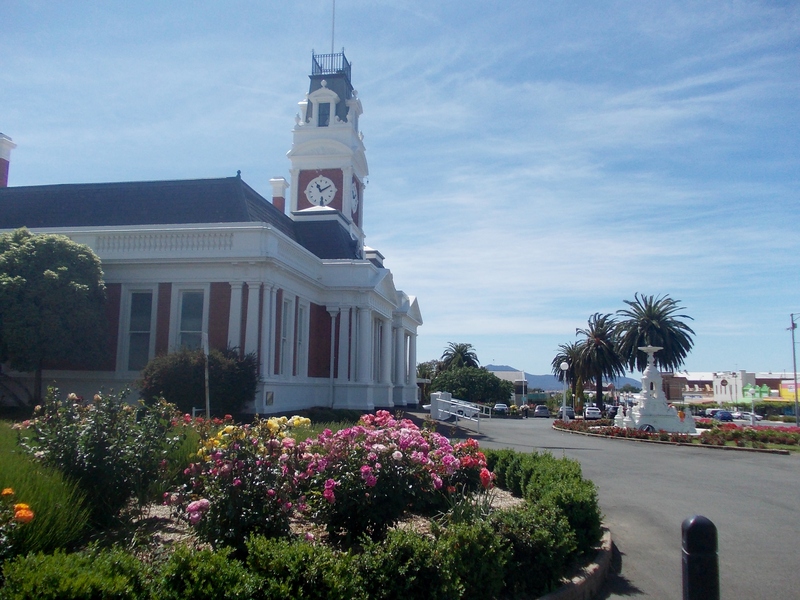 Later in 1891, the Diwells moved to Hamilton. The following year tragedy would occur again with the passing of five-year-old Ralph. In 1893, Ethel was born and another pregnancy in 1895 saw the birth of Rebecca but she sadly died in 1896 aged ten months. George was born in 1896, Martha in 1898. Which brings us back to 1900. Despite the losses of the past, life was continuing on for the Diwells. 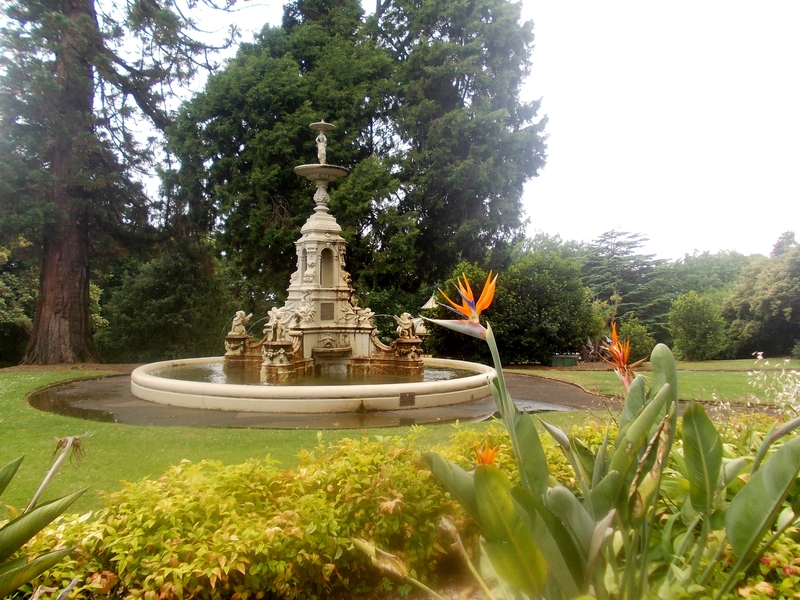 In March, William was voting in favour of the cancellation of that month’s Hamilton Horticulture Society flower show due to drought and Elizabeth was pregnant for the 12th time at the age of forty-four. Midway through October Elizabeth fell ill in and was nursed for the next three weeks until she gave birth to a daughter on 2 November. The baby was weak and died two days later. Elizabeth was also gravely ill and underwent an operation after the birth of the baby. She battled to stay but succumbed to peritonitis ten days later, on 12 November. 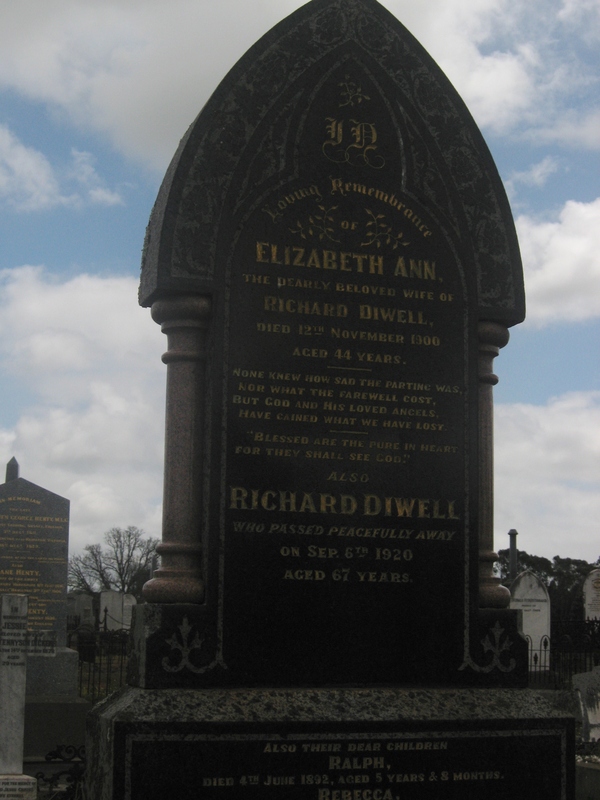 “… Another death which has evoked the deepest sympathy of all who knew her took place yesterday when Mrs Diwell, the wife of Mr Richard Diwell, bricklayer of this town, died after a short illness. 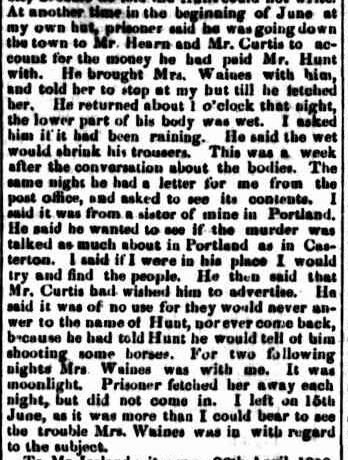 The deceased was the second daughter of Mr George Jelly of Casterton where she was born, and she came to Hamilton with her husband in 1891. She was taken ill three weeks ago and on the 2nd instance she was confined, the child living only two days. On Sunday evening she had to undergo an operation as the only hope of saving her life but at 3 o’clock yesterday morning she died of exhaustion, the diagnosis being peritonitis. Despite having several young children, Richard never remarried. The older girls Margaret and Jane would have taken on mothering duties of their younger siblings. Margaret married in 1905, but Jane did not marry until 1915 at thirty by which time youngest Martha was seventeen. Richard passed away in 1920 and was reunited with Elizabeth. Life was not altogether easy for the Diwell children, although they always managed a happy disposition. Margaret had seven children, however, three died, two as newborns. Edith, my great-grandmother, suffered through an unhappy marriage and spent much time as a single mother. Jane married twice, both husbands dying, the second after being hit by a taxi. She never had children. Ethel had four known children, one dying at birth. Martha or Mat as she was known was forty-one when she married and she also had no children. The boys, William, Ernest and George all married and became bricklayers like their father and grandfather before them, but Ernest passed away at just forty-eight. I was not lucky enough to know any members of this family but my mother fondly remembers and often talks of Grandma (Edith), Auntie Janey, Auntie Mat (Martha) and Uncles Bill and George. 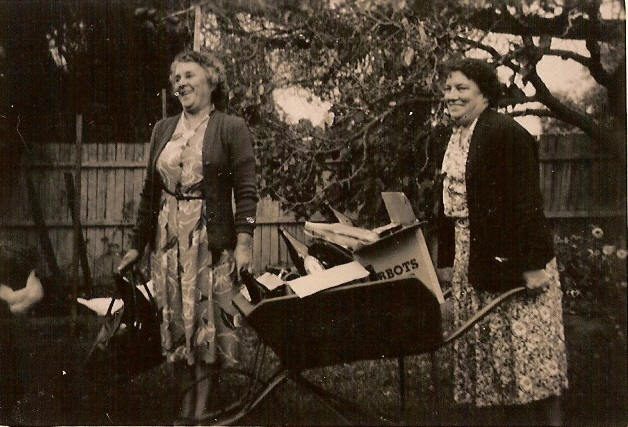 The photo above of Grandma and Auntie Mat depicts them just as Mum remembers, always laughing and smiling. As I look at the Diwell family photo I see Elizabeth as a devoted wife and mother but also a strong woman whose marriage was a partnership of two equals. I can see the woman who was confident enough to sign the Suffrage petition and I see a happy, kind person, traits she passed to her children. 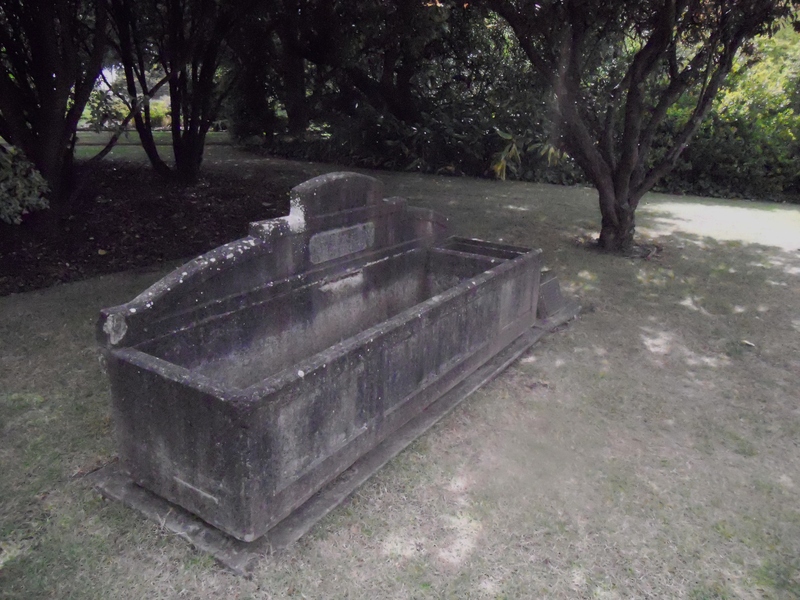 Next time I visit Richard and Elizabeth’s grave in Hamilton, I will be sure to take some Chrysanthemums.